Outback Jack toured Canada with several promotions including Stu Hart’s Stampede Wrestling..
November 7 (or 8), 1986: Outback Jack defeated Adolph Barbee by Countout in Calgary, Alberta. November 8 (or 9), 1986: Outback Jack vs. Vladimir Krupoff was a draw in Edmonton, Alberta. November 11, 1986: Outback Jack vs. Vladimir Krupoff was a draw in Regina, Saskatchewan. November 12, 1986: Adolph Barbee defeated Outback Jack in North Battleford, Saskatchewan. November 13, 1986: Outback Jack defeated Adolph Barbee in Cold Lake, Alberta. November 14, 1986: Outback Jack defeated Vladimir Krupoff in Calgary, Alberta. November 15, 1986: Outback Jack vs. Makhan Singh was a Double Countout in Montana Reserve, Alberta. November 16, 1986: Outback Jack defeated Adolph Barbee in Edmonton, Alberta. ~~~Owen Hart and Outback Jack vs. Great Gama and Makhan Singh was a No Contest in Edmonton, Alberta. November 19, 1986: Bill Kazmaier and Outback Jack vs. Ted Arcidi and Cuban Assassin was a No Contest in Red Deer, Alberta. November 20, 1986: Makhan Singh vs. Outback Jack ended in a Double Countout in Strathmore, Alberta. November 21, 1986: Makhan Singh vs. Outback Jack ended in a Double Count-out in Calgary, Alberta. November 22, 1986: North American champion Makhan Singh defeated Outback Jack by disqualification in Edmonton, Alberta. November 24, 1986: Outback Jack and Mr. Hito defeated Adolph Barbee and Vladimir Krupoff in Regina, Saskatchewan. November 26, 1986: North American champion Makhan Singh defeated Outback Jack in Victoire, Saskatchewan. November 28, 1986: North American champion Makhan Singh defeated Outback Jack in Calgary, Alberta. November 29, 1986: North American champion Makhan Singh defeated Outback Jack in Edmonton, Alberta. February 7, 1987 – Superstars: Outback Jack defeated Steve Lombardi. February 23, 1987 – MSG Network: Outback Jack defeated Barry O (Barry Orton). May 17, 1987 – Wrestling Challenge: Killer Khan vs. Outback Jack ended in a no contest. May 23, 1987 – Superstars: Hillbilly Jim and Outback Jack defeated Buddy Ryder and Dave Barbie. June 14, 1987 – MSG: Outback Jack defeated Jose Estrada. July 4, 1987 – Superstars: Killer Khan defeated Outback Jack. September 18, 1987 – PRISM: Outback Jack defeated Tiger Chung Lee. September 27, 1987 – Wrestling Challenge: Demolition defeated SD Jones and Outback Jack. October 3, 1987 – NESN: Nikolai Volkoff defeated Outback Jack. October 16, 1987 – MSG: Outback Jack defeated Jose Estrada. December 5, 1987 – Superstars: Butch Reed defeated Outback Jack. December 12, 1987 – Superstars: One Man Gang defeated Outback Jack. December 20, 1987 – Wrestling Challenge: Rick Rude defeated Outback Jack. January 13-14, 1988 – House Show: Outback Jack defeated Barry Horowitz. January 30, 1988 – Superstars: Demolition defeated Jerry Allen and Outback Jack. 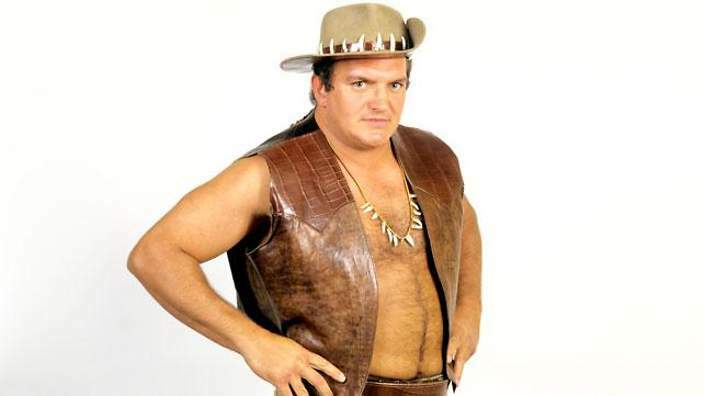 February 6, 1988 – House Show: Outback Jack defeated Brian Costello. February 7, 1988 – Wrestling Challenge: Bad News Brown defeated Outback Jack in a dark match. April 10, 1988 – Superstars: The Honky Tonk Man defeated Outback Jack. April 23, 1988 – Superstars: Ted DiBiase defeated Outback Jack. April 27, 29, 1988 – House Show: Outback Jack defeated Conquistador Uno. May 7, 1988 – Superstars: The Islanders w/Bobby Heenan defeated Outback Jack, Steve Blackman and Brady Boone. May 12, 1988 – House Show: Greg Valentine defeated Outback Jack.